Lodging facilities that offer free airport shuttle service to their guests are not required under the Americans with Disabilities Act to own their own accessible vehicles. They do, however, have to provide alternate accessible transportation at no charge for guests who use wheelchairs. To avoid a prolonged wait at the airport, make your request for accessible transport several days in advance of your arrival. This airport shuttle service, formerly known as Continental Airport Express, provides transportation between O'Hare and Midway and all locations in downtown Chicago including South Loop, West Loop and Lincoln Park. For standard vans and buses, no reservation is required for service from the airports to downtown, with departures every 15 minutes. Persons requiring a wheelchair accessible van should reserve at least one day in advance. 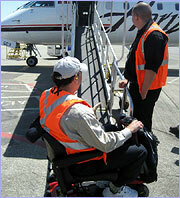 Up to two wheelchairs can be accommodated with advance notice. Please call for current one-way and round-trip pricing and multi-passenger discounts. More than 20 taxi companies in Chicago currently operate wheelchair accessible minivans equipped with ramps, wheelchair securements and shoulder seat belts. To order an accessible taxi, call the centralized dispatch service at the toll-free number above. The companies listed below rent hand-controlled vehicles at O'Hare and Midway Airports. Agencies generally request 1-2 day advance notice for rentals with adaptive equipment. Car rental companies, except for Alamo, are on the lower level near the baggage claim areas of Terminals 1, 2, and 3. In Terminal 5, the companies are available by courtesy telephones located on the lower level. Avis and Budget will provide drop off/pick up service at airport terminals, as will Enterprise if its lift-equipped shuttle vans are not available. All companies have at least some courtesy shuttles with lifts. Except for Alamo, car rental companies are inside the airport terminal, Lower Level Arrivals. Rental car pick-up is on Level 2 of the Midway Airport Parking Garage. Alamo is located a few minutes from the airport and has some shuttles with lifts; they will not drop off/pick up at the terminal. The following companies all provide delivery and pickup service at O'Hare and Midway Airports for an additional fee. The CTA Blue Line train provides 24-hour service between downtown Chicago and O'Hare International Airport. O'Hare station is centrally located in the airport, near Terminal 2 and under the airport's main parking garage. From the lower level baggage area, follow overhead signs for "Trains to City-CTA", take the escalator or elevator downstairs and then continue to follow signs along a lengthy concourse. The station itself is equipped with an elevator to and from the platform. An illuminated arrow points toward the next train leaving. Other CTA stations with elevators on the Blue Line are at Rosemont, Cumberland, Harlem, Jefferson Park, Logan Square, Clark/Lake, UIC/Halsted, UIC Medical District, Kedzie-Homan and Forest Park.. The trip to downtown Chicago takes approximately 40 minutes. The CTA Orange Line provides service between Midway International Airport and downtown Chicago. Hours of operation from Midway are 4am to 1am weekdays, 4:30am to 1am. Saturdays and 5:30am to 11:30pm Sundays and holidays. From lower level baggage claim, take the elevator at the south end of the terminal to level 3 and then follow signs for the CTA. This is a lengthy walk. The elevator down to the CTA station, hidden from view, is on the right past the steps and escalator. The station is also equipped with an elevator to take passengers to and from the train platform. All stations en route to downtown Chicago are equipped with elevators. In the Loop itself, Library-State/Van Buren, Washington/Wells and Clark/Lake are also accessible. The trip to downtown Chicago takes approximately half an hour.